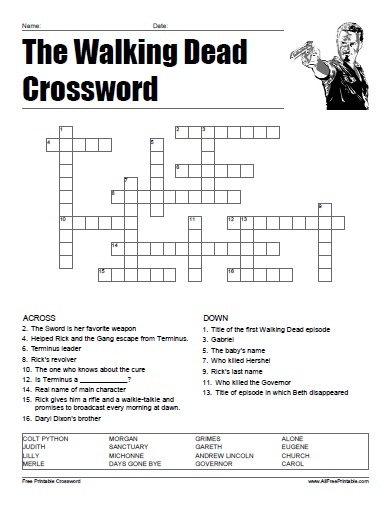 Free Printable The Walking Dead Crossword. Free Printable Crossword of facts from the favorite TV Series “The Walking Dead”. The Walking Dead Crossword that you can print and share with fans, family, friends, co-workers. Print it using your inkjet or laser printer and have fun solving this 16 word crossword. Includes clues from the AMC series 5 Seasons, Grimes, Michonne, Alone, Morgan, Gabriel, Carol, Gareth, Days Gone Bye, Sanctuary, Colt Python, Eugene and many more. The crossword includes the solution on page 2. Click the link below to download or print the The Walking Dead Crossword Puzzle now in PDF format.